London 25.06.2012 | It is a matter of great pride to learn that the investigation collaboration I did with Mabel Renhfeldt, about a multimillion dollar fraud in Paraguay, among others by Venezuelans Marcelo Barone and Elisabel Vasquez Galiño, has led to 15 indictments and two international arrest warrants. The fraud, perpetrated at CAJUBI, a workers retirement fund of the Brazil-Paraguay Itaipu hydroelectric dam, is believed to amount to $160 millions. Barone and wife-partner Vasquez Galiño, both Venezuelan, were last seen in London last December according to former PA and chauffeur. Between 2006 and 2007 they were given in excess of $36 millions, by corrupt CAJUBI executives for "high return investments." With the funds, Barone and Vasquez Galiño went on a real estate acquisition spree in London, in partnership with other local companies / partners. Both Barone and Vasquez Galindo are now wanted by Paraguayan authorities for their involvement in the fraud. Members of CAJUBI's executive board have been also indicted, while former prosecutor has been dismissed from the case. London 14.06.2012, 01:23 GMT | A lie is halfway round the world before the truth has got its boots on. This particular lie started with Bloomberg, which published today a piece entitled "Venezuela Overtakes Saudis For Largest Oil Reserves, BP says"
Venezuelan Orinoco Belt reserves are based on the OPEC Secretariat and government announcements. BP is clear, both in the press release and corresponding reports, that reserves figures are sourced from OPEC Secretariat -which gathers information from its members, Venezuela being one of them- and from Venezuelan government announcements. Chavez may be dying, but he is not mentally impaired just as yet. So of course, he is going to carry on blowing his own trumpet, saying that Orinoco Belt oil reserves are the largest in the world. However, has any independent party, from anywhere, checked the validity of Chavez's claim? Not long ago, his regime was also saying that Venezuela had eradicated illiteracy. They threw UNESCO in for good measure, just as Bloomberg has done with BP. However, all it takes to put paid to that claim is a trip to any Caracas barrio, yet the MSM had a field day repeating the BS about Venezuela being an "illiteracy free" country. And all it took me to debunk Bloomberg's impossible claim was one Google search, but by then the lie was half around the world. Needless to say that Bloomberg did not acknowledge my email, nor did it reply to it. But it did change its utterly misleading headline -without publishing a clarifying note, getting rid of the "BP says" part. Now, I am no journalist, nor do I claim to be one. But I do ponder about the reasons of using such complete fabrications by outlets like Bloomberg. If the original headline is to be taken at face value, my question to Bloomberg is: since when is BP an authoritative source in determining whether one OPEC country's oil reserves have surpassed those of another OPEC country? 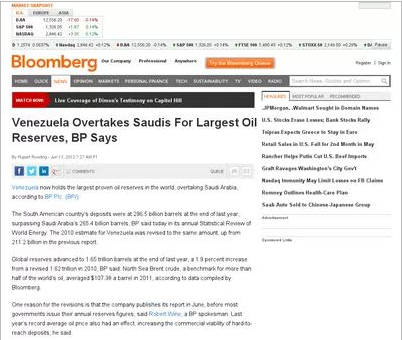 And if Bloomberg has realised the sheer preposterousness of its original headline, now that it has edited the BP bit out, who is claiming that Venezuelan reserves have surpassed those of Saudi Arabia? I'll tell you who, which is what BP actually said: Hugo Chavez and his regime officials. The estimates have been compiled using a combination of primary official sources, third-party data from the OPEC Secretariat, World Oil, Oil & Oil & Gas Journal and an independent estimate of Russian and Chinese reserves based on information in the public domain. Canadian oil sands 'under active development' are an official estimate. Venezuelan Orinoco Belt reserves are based on the OPEC Secretariat and government announcements. Therefore, it is not BP saying that Venezuela overtakes Saudis, but OPEC Secretariat (figures from Venezuelan government) and Venezuelan government own announcements. Have you bother asking yourselves whether those figures have been independently corroborated? Thanks for your email. At the bottom of the article you will have noticed the following paragraph. We are aware the data is from a collection of sources but as it was published yesterday in BP's Statistical Review, that is why it appeared with the headline ``... BP Says''. I did notice at first the paragraph you're referring to, though I still think that your choice of headline is totally misleading. A more appropriate one, reflecting the contents of BP press release and report, would have been "... OPEC says" which gets its numbers from Venezuela, or "... BP says citing OPEC / Venezuela sources", or even "... Venezuela / Chavez says". All of those would have negated the veracity and validity of the first part of what you claim with your headline, for none lends credence to it. Hence my email. I take that you have been reporting oil markets for a while, it wouldn't be a stretch for me to assume that you know as well as any other seasoned oil reporter / analyst that Venezuela / Chavez's claims about oil hold no water. None whatsoever. Complete fabrications with no basis in verifiable data. So why would Bloomberg / you echo Chavez's claims? Claims which -need be stressed- no independent party has corroborated? London 3 June 2012 - A couple of weeks ago, a friend draw my attention to an article in ABC Color, Paraguay's largest newspaper. It was about a Venezuelan, called Marcelo Barone, who had, allegedly, disappeared with millions of dollars worth of retirement funds belonging to workers of Itaipu, the humongous hydroelectric dam in the Paraná river, between Paraguay and Brasil. The news piqued my interest, and so I sent an email to enquire about it, and got in touch with Mabel Rehnfeldt, editor of ABC Digital. As it turns, Rehnfeldt, who has won international prizes for her investigative journalism, took a keen interest in my communication and given Barone seems to be based in London, asked if I could help in digging some information about him, and his companies, which I obviously did. Barone (MARCELO ALESSIO SILVIO BARONE SERRA) is Venezuelan, ID 6.558.248, DOB 28/11/1963. He is either married to, or lives with, Elisabel Vasquez Galiño, also Venezuelan, ID 6.240.641, DOB 23/09/1967. Both have dual citizenships apart from the Venezuelan: Barone Italian, and Vasquez Spanish. Barone and Vasquez are partners in a number of businesses / companies. The whole Paraguayan thing started in 2006, when CAJUBI -Caja Paraguaya de Jubilaciones y Pensiones del Personal de la Itaipu Binacional, or pension and retirement fund of Itaipu workers- gave Barone $4 million for, so called, high return investments. In 2007, Barone must have managed to convince CAJUBI board of directors that his financial acumen was extraordinary: he got another $32 million. In total, some $36 million were given to Barone. In the most bizarre circumstances, without any attempts at doing due diligence on Barone and his investment companies, the CAJUBI board signed a "Social Pact" that would destine the funds to Barone's companies, without requesting him to sign anything. That is to say, CAJUBI board disposed of $36 million of its workers' fund and does not even have a receipt signed by Barone. More troublesome still, Barone registered in Panama the company that got the funds two days after the funds were approved. "How extraordinary" I thought. Some dodgy fellow lands in Paraguay, pretending to be Panamanian, arguing that he's got a PhD (from where?) and, without a track record in banking, securities or financial services anywhere says he has a formula that should bring phenomenal returns (?? ), and CAJUBI executives give him $36 million, just like that, without even asking for a signature in a contract? So I decided to dig. Barone had/has 9 companies registered in Panama (link 1, link 2), two in Florida (link 1, link 2), and one in the UK (link). He purchased a couple of multi million pound properties in Hyde Park (link) and St James (link), through one company registered in Guernsey (link), and one in the UK (link). That's four jurisdictions right there. Barone is not registered as a financial service provider / adviser with the Financial Services Authority in the UK, nor with its counterpart in Florida. Two of Barone's companies, Plainc Inc and Plainc Asset Management Inc., have been the object of alerts to investors issued by the Panamanian Superintendence of Stock Markets (Superintendencia del Mercado de Valores), neither having "been issued any kind of license by the Commission, nor ha[ve] been authorized to carry out businesses as a financial intermediary of securities or investments in or from Panama." Barone also registered investment funds, presumably for the purposes of his dealings with CAJUBI. All the funds (Euroinvest Property, Euroinvest Global Diversified, Euroinvest GBP, Euroinvest Alternative Markets and Assets) were registered in Panama, and all of them are inactive, according to Bloomberg. Despite the fact that Barone pitched some of his Panamanian companies as the ones to be used for his "investments", funds transferred by CAJUBI were never sent to that jurisdiction, but to the US, Switzerland and the UK, between March 2007 and May 2008, to Resitrust Inc. and Euroinvest Worldwide Inc. accounts in Bank of America, Dresdner Bank and Citibank respectively. By now, it is more than evident that CAJUBI executives are up to their ears in this fraud to workers' pension funds. As I understood from Rehnfeldt, 80% of the board is formed by political appointees and only 20% are workers representatives. Paraguayans are, quite naturally, incensed by the obscene display of wealth and lifestyle of Barone, let alone by the thugs involved in the racket, and the authorities that are doing nothing to recover pensioners' funds. Beyond the galloping corruption of CAJUBI and Barone, the latter's operations in various jurisdictions just depicts the ease with which individuals involved in transnational criminal activities can operate with absolute impunity and freedom. 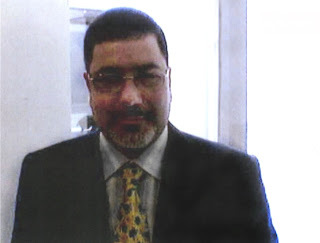 For according to sources consulted Barone has also pitched his services here in the UK, where not only he is not registered to carry out such activities but he appears to be a non-dom. Barone does not pay taxes in Panama, the US, the UK, or Venezuela. In addition, as far as our research goes, he is not properly registered to provide the services he offers in any of the jurisdictions where he operates.